Bram Stoker's classic tale of horror is not a novel - it's an after-action report describing an attempt to recruit a vampire as a spy. Operation Edom redacted the text, concealed vital material and key players, and released it as fiction - as disinformation. The original, unredacted document they locked away in MI6's most secret vault. Three generations of analysts - in 1940, in 1977, and in the present day -annotated the text, tracing the secret history of Count Dracula through the 20th century. Now, that unredacted document is in your hands. The key to the Count's fiendish plans. The ultimate revelation. Read it and become a target. Stands alone as the revelation of Bram Stoker's true agenda. 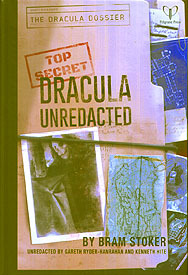 Pairs best with Dracula Dossier Director's Handbook as a handout for Night's Black Agents.